Air quality laws are breached every day by a factor or two or more along London’s busiest roads (and elsewhere). No other public health or environmental standard is breached on such a large scale with such serious consequences for public health. Clean Air in London (CAL) has therefore lodged a formal complaint with the European Commission (Commission) about the UK’s failure to comply with air quality laws. ‘Part one’ of the Complaint is that: the UK obtained unlawfully a time extension to comply with the daily limit value for dangerous airborne particles (PM10) in London; and, without prejudice to that part of the Complaint, even if a time extension is sustained for the PM10 daily limit value, it was breached in Neasden Lane, London (again) in 2011. ‘Part two’ of the Complaint is that: the UK breached the annual mean and hourly limit values for nitrogen dioxide (NO2) in London and 16 other zones in 2010 (and 2011); and has not applied for a time extension for those zones (i.e. it submitted: plans for 23 zones in September 2011 under Article 22 of Directive 2008/50/EC on ambient air quality and cleaner air for Europe; and plans for London and 16 other zones under Article 23). These are not new laws. An Air Quality Framework Directive (Council Directive 1996/62/EC), covering ambient air quality assessment and management, entered legislation in 1996. It was followed in 1999 by a so-called First Daughter Directive (Council Directive 1999/30/EC) which set limit values for various pollutants including NO2 and PM10 and thresholds for assessing and managing air quality for the pollutants concerned. Since 1999 therefore, limit values to be attained and not exceeded have been: an annual mean of 40 µg/m3 and not more than 35 days over 50 µg/m3 for PM10 from 1 January 2005; and an annual mean of 40 µg/m3 and not more than 18 hours over 200 µg/m3 for NO2 from 1 January 2010. In other words, the legal limits for PM10 are up to twice World Health Organisation (WHO) guidelines whereas those for NO2 are aligned with WHO guidelines. Directive 2008/50/EC entered into force on 11 June 2008. Amongst other things, it set new standards for fine particles (PM2.5) to be achieved by 2015 and 2020 and allowed Member States to apply for a time extension to comply with limit values for PM10 and NO2. Time extensions can only be obtained if a Member State meets strict conditions including demonstrating that compliance with the limit values will be achieved by the new deadline. The latest deadline possible for PM10 was 11 June 2011. After two failed attempts to obtain a time extension, the UK obtained unlawfully a time extension until 11 June 2011 to comply with the PM10 daily limit value in London after submitting an updated air quality plan to the Commission without consulting the public on it. The good news for public health is that no further time extension or breach of the PM10 annual and daily limit values is allowed in London (or elsewhere). The latest deadline possible for NO2 is 1 January 2015. The Government has said it can’t (or won’t) comply with the NO2 limit values in London until 2025 and so is unable to meet a basic condition of a time extension i.e. to demonstrate compliance by no later than 1 January 2015. In fact, Mayor Johnson listed 14 measures in his Air Quality Strategy published in 2010 to show that the NO2 limit values could be complied with by 2015 if Government support was forthcoming. Even if a time extension for NO2 were to be obtained in future, another requirement of Directive 2008/50/EC is that the limit value plus margin of tolerance must not be exceeded during the period of a time extension i.e. an annual mean of 60 µg/m3 and no more than 18 hours over 300 µg/m3. Annex III of Directive 2008/50/EC emphasises that limit values apply everywhere in ambient air unless: the public do not have access; or all relevant provisions concerning health and safety at work apply. Other legal standards exist for pollutants such as benzene, carbon monoxide, lead and sulphur dioxide and there are targets for ozone. Directive 2008/50/EC introduced legal standards for fine particles (PM2.5): an annual mean of 25 µg/m3 to become a limit value on 1 January 2015; a 20 µg/m3 exposure concentration obligation in 2015; and an exposure reduction target in percentage terms by 2020. Air quality laws can be enforced by the Court of Justice of the European Union (CJEU) and in the UK Courts. The former involves the European Commission in a five stage legal (or infraction) process: (i) Letter of Formal Notice (first written warning); (ii) Reasoned Opinion (second and/or final written warning which the UK had reached for PM10 before it obtained a time extension in 2011); (iii) reference to the CJEU requesting a judgement that the Member State is in breach and must comply; (iv) Letter of Formal Notice; and (v) reference to the CJEU requesting the imposition on the Member State of lump sum and daily fines. The Mayor of London has estimated that such fines, which could be passed to London under the Localism Act 2011, could total £300 million per year for each of PM10 and NO2. CAL considers that fines (or gaol) are a necessary final sanction in any legal system. In CAL’s view, this judgement was not consistent with Article 30 of Directive 2008/50/EC which says ‘Member States shall lay down the rules on penalties applicable to infringements of the national provisions adopted pursuant to this Directive and shall take all measures necessary to ensure that they are implemented. The penalties provided for must be effective, proportionate and dissuasive.’ ClientEarth is understood to be seeking leave to appeal this judgement to the Court of Appeal. For those seeking compliance with ambient air quality laws, important other provisions exist in: the Clean Air Act 1993; Policy 7.14 of the London Plan; and the Air Quality Standards Regulations 2010. All this matters for London and the Olympics since limit values must not be exceeded once attained and air pollution may not be worsened where limit values are already breached. CAL has sought assurances about the impact of the Olympic Route Network after the Strategic Environmental Assessment for the Olympic Transport Plan admitted in April 2011 “However, the number of daily mean exceedances at some roadside sites is anticipated to be more than the allowable number of exceedances.” Transport for London has promised several times since last October to provide CAL with details of the environmental impacts and the mitigation of them but these are still awaited. At the moment, it looks like Mayor Johnson’s plan is to use pollution suppressants on roads in front of official air quality monitors during the Olympic and Paralympic Games to reduce local air pollution and ensure compliance with the PM10 daily limit value in London. Even this fraudulent approach would do nothing to ensure compliance with NO2 limit values. The UK’s actions and failures to date give a clear indication of how it is likely to behave when revisions to air quality legislation are considered in 2013 and beyond. Article 32 of Directive 2008/50/EC requires ‘In 2013, the Commission shall review the provisions related to PM2.5 and, as appropriate, other pollutants and shall present a proposal to the European Parliament and the Council’. The Commission has said it is reviewing also the National Emissions Ceilings Directive and plans a ‘Year of Air’ in 2013. CAL’s response to the Commission’s consultation emphasised the need for robust enforcement of current legislation and continuity and the further tightening of health and legal protections. The Government is suggesting the ‘simplification’ of the current air quality regime by: only having targets where action is needed; minimising the number of targets per pollutant (e.g. only one? ); the review of the zonal approach for reporting; and reducing the ‘complexity’ of the reporting framework. The Government is also seeking to undermine the legal standards for PM2.5 rather than suggesting better ways to enforce them. CAL understands that the Government and the Mayor of London are seeking ‘flexibility’ in the legal requirements. CAL strongly opposes such an approach since there is no chance the authorities will comply with flexible obligations having failed to comply with strict ones. In any event, with elections for the European Parliament due in May 2014, it seems unlikely that any changes would enter legislation before 2015 or 2016 at the earliest. It is totally unacceptable that the UK is cheating on air quality laws and misleading the Commission. 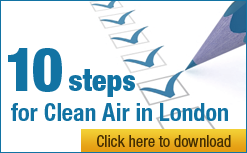 Clean Air in London urges the Commission to ‘throw the rule book’ at the UK and London well before the Olympics. This is the second in a series of six articles being written for Politics Home by Simon Birkett, Founder and Director of Clean Air in London, about air quality in the lead up to the London 2012 Olympics. The six articles will address health impacts, legal issues, sources, solutions and opportunities; indoor air quality; and the Olympics.